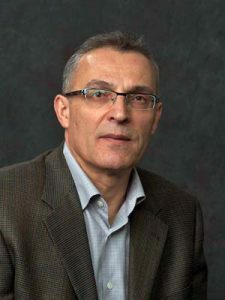 Apostolos Serletis is Professor of Economics at the University of Calgary. Since receiving his Ph.D. from McMaster University in 1984, he has held visiting appointments at the University of Texas at Austin, the Athens University of Economics and Business, and the Research Department of the Federal Reserve Bank of St. Louis. His teaching and research interest focus on macroeconomics, monetary and financial economics, energy economics, and nonlinear and complex dynamics. He is the author of eight books, including Principles of Economics: Second Canadian Edition, with R. Glenn Hubbard, Anthony Patrick O’Brien, and Jason Childs (Pearson 2018), The Economics of Money, Banking, and Financial Markets: Sixth Canadian Edition, with Frederic S. Mishkin (Pearson, 2016); Macroeconomics: A Modern Approach: First Canadian Edition, with Robert J. Barro (Nelson, 2010); The Demand for Money: Theoretical and Empirical Approaches (Springer, 2007); Financial Markets and Institutions: Canadian Edition, with Frederic S. Mishkin and Stanley G. Eakins (Addison-Wesley, 2004); and The Theory of Monetary Aggregation, co-edited with William A. Barnett (Elsevier, 2000). In addition, he has published more than 200 articles in such journals as the Journal of Economic Literature, Journal of Monetary Economics, Journal of Money, Credit, and Banking, Journal of Econometrics, Journal of Applied Econometrics, Journal of Business and Economic Statistics, Macroeconomic Dynamics, Journal of Banking and Finance, Journal of Economic Dynamics and Control, Economic Inquiry, Canadian Journal of Economics, Econometric Reviews, and Studies in Nonlinear Dynamics and Econometrics. Professor Serletis is currently an Associate Editor of four academic journals, Macroeconomic Dynamics, Energy Economics, Open Economies Review, and the Journal of Economic Asymmetries. He has also served as Guest Editor of the Journal of Econometrics, Econometric Reviews, and Macroeconomic Dynamics.